The representatives of Government of Karnataka and ICRISAT during the launch of Suvarna Krishi Grama Yojane. Farmers in 1,000 villages of Karnataka, India, are expected to benefit in a major way through a new collaborative initiative that was launched recently. In the first phase, 105 villages will be developed as model villages and targeted farmers’ incomes will be increased by 20% in one year through augmented productivity, diversification and market linkages. Recognizing the potential for a strong collaboration in dryland agriculture, the Government of Karnataka and ICRISAT along with consortium partners, launched a new scheme called Suvarna Krishi Grama Yojane: Transforming agriculture and livelihoods in rural Karnataka (Golden Agriculture Village Scheme) on 3 August in Hirebidnur town of Karnataka. Mr Krishna Byre Gowda, Minister of State for Agriculture, Karnataka, launched the scheme. By actively involving the community from the start, the main objective is to transform rural areas by developing an impact oriented participatory model using state of the art technologies. This model can be scaled up for more integrated and sustainable rural development in the state. A comprehensive approach will also be taken by promoting Inclusive Market Oriented Development (IMOD) that links farmers with the markets and builds stable partnerships. “Our government is keen to ensure large benefits to farmers in the state by bringing science-led development to the farmer’s doorstep with technical support from premier international institutions like ICRISAT and our state universities through schemes like Bhoochetana and Bhoo Samruddhi. 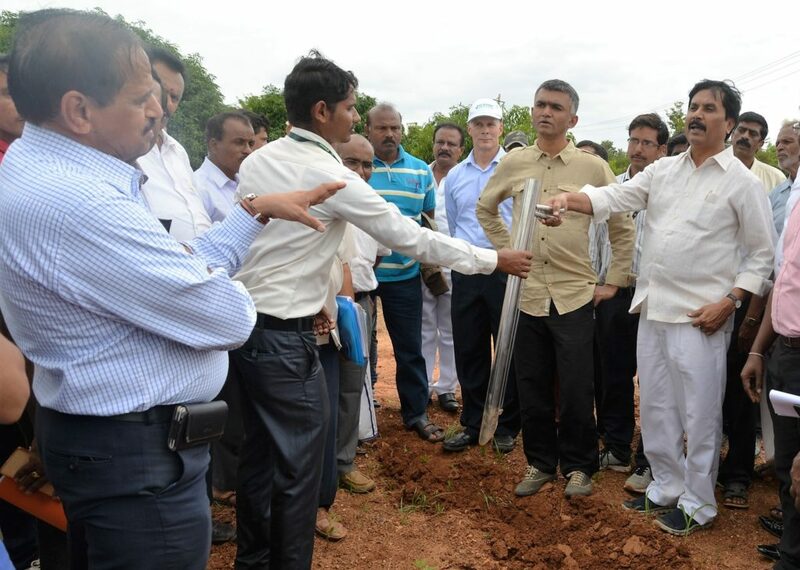 We are now strengthening our collaboration with ICRISAT and other international institutions, state universities and departments of Karnataka government (Agriculture and allied sectors) to enhance the impact of Suvarna Krishi Grama Yojane,” said Mr Gowda. ICRISAT’s Asia Program Director Dr Suhas P Wani (left) with Hon’ble Minister of State for Agriculture, Karnataka Mr Krishna Byre Gowda (2nd from right ); Hon’ble Deputy Speaker, Karnataka Legislative Assembly Mr N. H. Shivashankara Reddy (right) and ICRISAT Director General Dr David Bergvinson (3rd from right) in Hirebidnur, Karnataka. One of the most important strategies to be adopted for achieving the vision of this new scheme is to undertake science-led and demand driven development of rural areas by adopting the principal of convergence, collective action and capacity building through a consortium approach, where all partners and stakeholders work together. “We request ICRISAT to bring new technologies and demonstrate to our farmers along with the other institutions and universities to benefit the farmers. The most important thing is we need to change our mindset so that new technologies are adopted and farmers get the benefit through this scheme,” said Mr NH Shivashankara Reddy, Deputy Speaker, Karnataka Legislative Assembly and MLA, Gauribidanur town. Two books — Enriching Farmers’ Lives: Bhoo Samruddhi and Transforming Rural Livelihoods thru Mission Bhoochetana were also launched during the occasion. The Government of Karnataka decided to implement the Suvarna Krishi Grama Yojane as indicated in the 2015-16 budget speech of the Chief Minister of Karnataka in pilot districts which will be scaled-up in a phased manner in subsequent years. The new initiative is expected to provide better livelihoods to thousands living in rural communities in Karnataka through skill development, higher productivity, profitability and increased happiness due to better infrastructure and facilities in their areas.